The cultures of the West should look beyond the Roman and Greek civilizations for new inspiration. There existed centuries before a great work of antiquity attributed to a sage. Its date of composition can never be fixed with any certainty, particularly as, in common with other Sanskrit classics, it was not at first committed to writing but passed on generations from singer to singer. The sage Valmiki, Chief among Munis and most eloquent of men, constantly engaged in study of holy scriptures enquired the most knowledgeable Narada - “who is there in the World, endowed with excellent and heroic qualities, who is versed in all duties of life, grateful, truthtul, firm in his vows, benevolent to all beings, learned, eloquent, handsome, patient, slow to anger – one who is truly great; who is free from envy and One whose wrath can strike terror to celestial beings. Narada replied - " Rare indeed are those, endowed with the qualities thou hast enumerated, yet I can tell thee of such a one – born in Ikshwaku clan, named Sri Rama. Srimad Ramayanam, the most ancient and reverred epic comprises of nearly 24000 slogas stating the journey of Lord Rama set to annihilate the demon Ravana in lanka. In this beautiful land replete with scholars, I do not possess enough knowledge to write at length on the mahakavya. Rampur Raza Library, located in Rampur, Uttar Pradesh, is a repository of Indo-Islamic cultural heritage and a treasure-house of knowledge established in last decades 18th century, and built up by successive Nawabs of Rampur and now managed by Government of India. It contains very rare and valuable collection of manuscripts, historical documents, miniature paintings, astronomical instruments and rare illustrated works in Arabic and Persian. We have heard about Persia. Prince of Persia is an entertaining video game created by Jordan Mechner, originally published by Brøderbund, then the Learning Company, and currently Ubisoft. It was all about setting free a beautiful princess amidst various dangers. Persian, also known as Farsi, the predominant modern descendant of Old Persian, is one of the Western Iranian languages within the Indo-Iranian branch of the Indo-European language family. It is primarily spoken in Iran, Afghanistan and Tajikistan. Persian is a pluricentric language and its grammar is similar to that of many contemporary European languages. Wikipedia states that there are approximately 110 million Persian speakers worldwide, with the language holding official status in Iran, Afghanistan, and Tajikistan. For centuries, Persian has also been a prestigious cultural language in other regions of Western Asia, Central Asia, and South Asia by the various empires based in the regions. The holy Ramayan has been translated in many languages. Valmiki Ramayan is available in many English versions. Way back in 1880 FS Growse translated Thulasidas Ramayan. In 1952, Oxford University Press published the work of W. Dagnal P Hill. Now we are reading more about one particular version of 1715, which has attracted so much of media attention, thanks to our PM Shri Narendra Modi. US President Obama’s historic visit to Hanoi, where he announced the U.S. is ending the 41-year U.S. arms embargo against Vietnam, and also oversaw new business deals worth about $16 billion was historical. More fraught part of the continent is that of three leaders—Iran’s President Hassan Rouhani, Indian Prime Minister Narendra Modi, and Afghan President Ashraf Ghani—signing a flurry of deals in Tehran on Monday, aimed at reworking political obstacles that have hobbled the region’s economies through years of war and economic boycotts. Shri Modi spoke thus - Centuries of free exchange of ideas and traditions, poets and craftsmen, art and architecture, culture and commerce have enriched both our civilizations. Our heritage has also been a source of strength and economic growth for our nations. The richness of Persian heritage is an integral part of the fabric of the Indian society. A part of Iranian culture lives in Indian hearts. And, a slice of Indian heritage is woven into the Iranian society. Our ancient heroes and epics bear striking parallels. .. .. .. .. .. The great medieval poets of India have called the Persian and Sanskrit the two sisters. India's religious epic Ramayana which has seen over a dozen translations in Persian is known to have about 250 words of Persian. It served as a court language in medieval India. But, its popularity is also because it is written on the hearts of the Indians. It is taught in around 40 universities in India. All India Radio has been running the Persian language service for last 75 years. 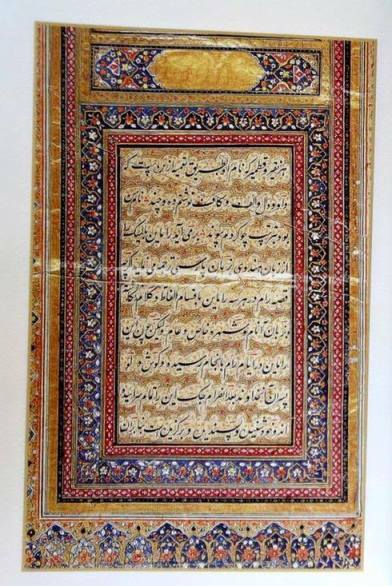 India has a proud collection of almost 5 million manuscripts of Persian in public and private collections. There are more than 20 million documents in Persian in National and State Archives. More than the speech, Indian Prime Minister Mr Narendra Modi, gifted the supreme leader of Iran Ayatollah Sayyid Ali Hosseini Khamenei a specially commissioned reproduction of a rare seventh-century manuscript of the Holy Quran attributed to Hazrat Ali, the fourth caliph. 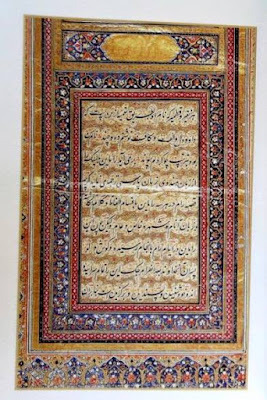 Written in Kufic script, this manuscript is stated to be a prized possession of the Ministry of Culture’s Rampur Raza Library. 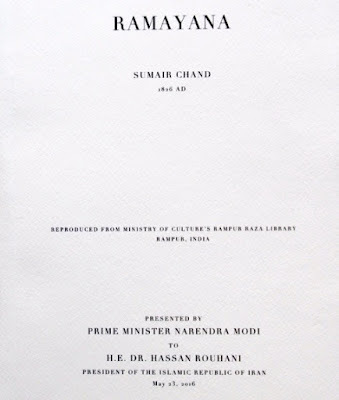 Modiji also gifted the Iranian President Dr. Hassan Rouhani specially commissioned reproductions of Mirza Asadullah Khan Ghalib’s collection of poetry in Persian, Kulliyat-e-Farsi-e-Ghalib, as also Sumair Chand’s Persian translation of Ramayana. 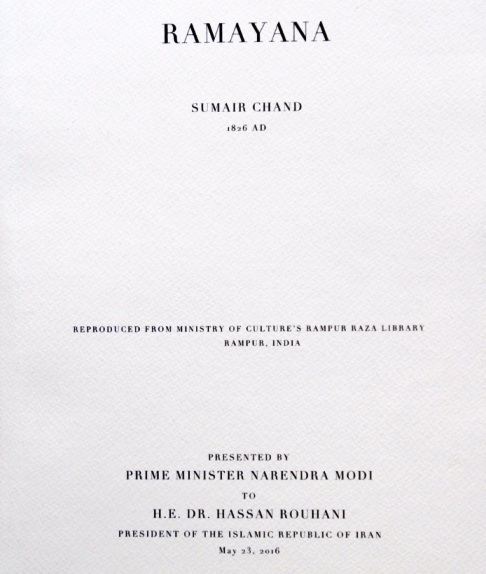 Translated into Persian in 1715 and copied in 1826, Sumair Chand’s Ramayana is a rare manuscript at the Ministry of Culture’s Rampur Raza Library, and contains over 260 illustrations – possibly the largest number in any hand-written Ramayana manuscript. Not much was written about this earlier, but the media is all buzz about the Persian language translation of holy Ramayana !